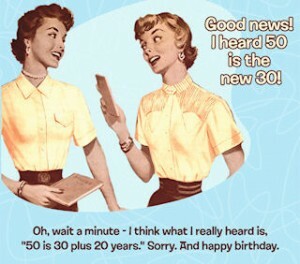 I remember when I used to think 50 was old! Now I feel in better health than I did in my 30’s, my marriage is better now than then, my spiritual life is more fulfilling, everything about life is good. My eyesight is a little impaired and my joints complain every now and then. I haven’t ever had a “hard” birthday where I wanted to be younger or lied about my age. I turned 50 today and am proud of it! I earned every gray hair, and God has richly blessed me. I plan on things only getting better the closer I get to the end! Amen. Happy Birthday. As Bob Dylan said once, “I was so much older then, I’m younger than that now.” рџ™‚ Have a blessed day. Ha! Never heard that one. My husband always thinks he is young no matter what, and he is now pushing 60! I think I have always been an “old soul.” Thanks, Mel.